In his Miami Herald column, Leonard Pitts Jr. writes that a presidential campaign constitutes the world's longest and toughest job interview. He condemns the slate of GOP candidates for failing to have thought deeply about the world and America's place in it. Then again, they may be incapable of it, he speculates. 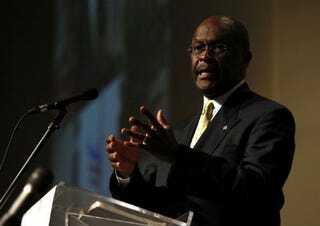 On Monday, an editorial in the Manchester (New Hampshire) Union Leader attacked Herman Cain for blowing off an interview with the paper. It seems that after video of Cain stumbling to articulate a position on Libya in an interview with The Milwaukee Journal Sentinel went viral last week, the candidate instituted a new rule: no video cameras in newspaper interviews. But the damage is done. The attack solidifies a perception that he does, indeed, have something to hide, i.e., the fact that once you get him past his talking points (“9-9-9” and fences to electrocute unsuspecting Mexicans) — he really has nothing to say.